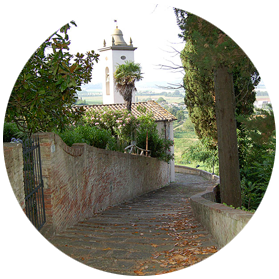 For the variety and beauty of the land, the importance in the course of history and folk traditions, Palaia is one of the most interesting places in the province of Pisa. Its origins date back to the fourth century, and the various discoveries made in recent years confirm that the area was populated since Etruscan times in that dromos tombs, fargments of every day pottery (earthen ware pots), marble memorial stones belonging to the tombs dug into the tuff, have been found here. The conformation of the territory, the handicraft and the techniques for the processing of materials make us later on, with the advent of the Romans, the Valdera was subdivided according to the system of land division: the land was cultivated by slaves whereas the nobles lived mainly in the town of Pisa. With the fall of the Roman Empire up to the year 1000, the countryside emptied and decayed, the plains got marshy and the hills filled up with woods. In the eleventh century, the population begins to concentrate around the lord’s manor and the building of the medieval castle characterized by two drawbridges drooping on the overhanging rocks, dates back to this period. Throughout the middle ages, Palaia is a source of contention, due to its geographical and strategic position between Pisa, Florence and Lucca. In fact, until the twelfth century it is under the jurisdiction of Bishop of Lucca , but, since 1192 it came under the Republic of Pisa. It was in that century that Palaia had a Municipal Statute that guaranted it a certain autonomy. Palaia takes its original name in that period; it means precisely “place where posts are made”. In fact, because of the plain and the frequent floods of the rivers, large amounts of poles were used to stem the waters and part of them were also sent to Pisa for the construction of ships.
. The famous St. Martin’s Parish Church. In 1406 it passes under the rule of Florence and five years later, in order to put an end to that rule, Niccolò Piccinino occupies the village, killing many inhabitants and imprisoning the Florentine Commissioner, a gesture thwarted by the peace of Ferrara in 1433 which brought the village back under the Florence Jurisdiction. At the beginning of the century, when the plane is over, Palaia has to face a serious economical and political decline under the French Rule. In the 9th century, due to the exploitation of agricultural resources, the country’s economy flourishes again, but it os only in 1927-28 that we can see the present territorial configuration of the village. Our route starts from St. Martin’s Parish Church, at 400 meters from the walls built on a design of Andrea Pisano between 1270 and 1300 in the Romanesque Style and included in the official list of the national monuments. It stands outside the inhabited centre because it gathered the parishioners. It is subdivided into three five-bayed aisles with a raised presbytery housing three chapels. At the entrance of the Church, on the left, we can find the ancient baptismal font, while in the centre of the nave there is a hexagonal baptismal font. The body of the church is romanesque in style, while the apse is gothic. In the floor there are the graves of some famous people of the village, while on the wall there are the ones of all the parish priests of Palaia. In 1564 Alessandro Guidiccioni pointed out the poor of the parish church which had even been deconsecrated. Guidiccioni ordered some restorations and the closing of two side doors for savings reasons. After its passing under the Diocese of San Miniato in 1639 and at the end of the plague, the parish church was restored again, enriched after the new baroque style and newly consecrated on 23rd May 1689. The restorations, however, did not solve the problems of the church which was closed once again, in 1814 along with the adjoining cemetery. Thirty-two years later, an earthquake furtherly worsened its conditions, but at the end of the 19th century the building was completely renovated by engineer Filippeschi who wanted to give the buiding back its austere and bare aspect, typical of the Medieval tradition, by removing all the Baroque details. Walking along the street, we can find the market square, where markets and fairs still take place. The structure was built between 1620 and 1630 at the maximum spread of the plague in the area. In fact a hospital was built in order to get contagion under control as much as possible. Just before entering the village, we can find the “Villa del Borgo”, a brick building with a beautiful public park. On the way leading to Montefoscoli there stands St. Francis Church of 1600, built by the local families Cecchi and Pini for their private burials. Immediately after this Church, there is the source of Fonchioni which was the only water supply up to the construction of the pipeline in 1950. Under the road there still exists the washroom where people were obliged to wash only the clothes belonging to sick people hit by contagious diseases. 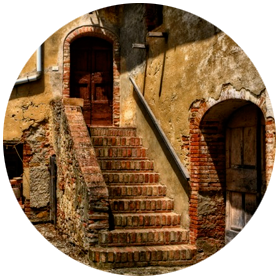 You can enter the village through the Florentine gate, characterized by a lowered arch, dating back to the 12th century. On the right you can still see the Fort that presided over the door, while on the left there is the guard tower. Once beyond the door there is St. Mary’s Church mentioned in a document of 1200, probably dating back to the second half of the previous century (11th century). It is in the romanesque style and inside it you can admire the “Madonna with child” in glazed by Luca della Robbia (1400-1482). After passing the “Republic Square”, or Mercatale (as it was called in the past) because it was the palce for markets and fairs, we walk on along “Via del Popolo” (People’s Street) till to reach another door, surmonted by a tower, dating back to the 16th century, which was transformed, after 1665, into the ivic clock tower to witness the Florentine rule, upon Palaia. On the left, “Via della Fonte” leads to the public washrooms. Beyond the gate there is a short stretch of open road bordered by a wall on the left; here, there was one of the drawbridges leading, since the 11th century, to the castle and the fortress. On the left of “Via del Popolo” there stands the church of St. Andrew the Apostle dating back to the 11th century. Inside it you can admire numerous works of art, among which The “Madonna del Carmine” by Francesco Valdambrino (1403) and the “Crucifix” by Giovanni Pisano (1245-1314). Walking along Via Andrea Mino, ending at the section of the wall where the “Pise gate” once stood, (the gate was destroyed in 1850), you can follow “Via del Forte” leading to the Fortress, which is the highest point of the village and from which you can enjoy a vast and (magnificent) wonderful view. 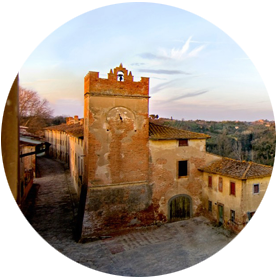 The name “Rocca” comes from a very large and high tower built in ancient times. It already existed in the 10th century, as a public document of 98o witnesses. In the past, the citadel stood in that area and it consisted of a square tower with large bells, a “cassero” (the highest and fortified part of a fortress) and crenellated walls. From a document of 1077, we learn that the Fortress had been surrounded with ditches and charcoal pits (blind, deep holes dug along the ditches in order to prevent access to the castle). Florence ordered the last restoration and partial reconstruction of it in 1509. The surrounding territory is rich in characteristic and beautiful little villages, at a short distance from Palaia and easy to reach. The name is of Lombard origin and the term means “country house”. In 980, the Bishop of Lucca gave the Parish Church of San Gervasio half of his possessions including Villa Saletta.It belonged to the Calci Carthusian Monastery till 1461, the year when it was sold to the Riccardi Family, cousins of the Medici.The “Villa” was built in the early 16th century and the village was built all around it between 1760 and 1770 to accommodate farm workers. Also the Church was built in the same period and in the period of its greatest economic splendor the property included a manor house, the village and 32 farms.Between the 15th and 16th century, the Florentine Family contributed to the process of unification of the several farms and to introduce the contract of sharecropping.With the decline of the Riccardi Family in the 19th century, the property passed to Niccolai Gamba Castelli until 1996, when the whole village was sold to a British company. The estate covers about 700 acres of woods, olive groves, vineyards and arable land.The large square with its ancient clock tower (which is six hours in six hours: six hours of dark; six hours of darkness; six hours of light, six hours of day) is very striking. Originally, the village of Alica was nothing but a castle with an adjoining farm as it is witnessed since before the year 1000. The struggles for its possession, which characterized most of the Valdera took place here, too. It is important to stress the plundering from the florentines in 1495 which followed the popular uprising of the previous year. St. Jacopo’s Church is the present one though most people think that a monastery (suppressed at the beginning of the 19th century) was standing in the ancient castle. Even today, the village shows its ancient feature: the “Villa” is in the centre where once stood the castle, and houses dating from 17th and 18th centuries. 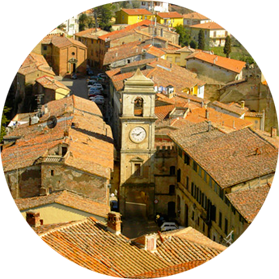 Montefoscoli is a small village of Palaia Municipality. A permanent exhibition of farming was set up in the village with its headquarters in a house dating back to the year 1000. Traces of the past have been recovered thanks to the discovery of many objects which have been set in such places as the oil-jar stores, the grain storehouse, the laundry, the Blacksmith’s forge and the cellar. You can also visit the Museum house of Vaccà Berlinghieri with a collection of surgical instruments. Just outside Montefoscoli, in the small village “called Torricchio”, we can find an unusual and spectacular buiding: “The Temple of Minerva Medica” erected in 1823 by the famous pisan architect Rodolfo Castinelli on commission of the physician Vaccà Berlinghieri, in memory of his father Francis, a doctor himself. The building is a Pagan Temple in a bright fire color hidden in a oak grove hemming the Valdera. It has the features of the ancient temples; eight doric columns adorn the facade and form porch. Toiano is a small uninhabited village where everything is just as its last inhabitants left it.It is placed in a beautiful natural park characterized by very steep gullies that appear as ridges of land completely bare of vegetation.Thanks to its unique location, you can have a complete view of the whole Valdera as far as Volterra. It is the most important village of the Palaia surroundings. It is divided into two districts of which one is on high and tho other in the plain; of course, it is in the latter part that the village is still developing and growing.Most people live in this part.Forcoli is not far from the major centers to which it is easily connected.In the past, the village of Forcoli was a very important market.The upper part of the village is the oldest one and shows its original structure as a castle-village.Even the apse f the church is made from a sturdy tower belonging to the old castle. The ancient village of San Gervasio is one of the smallest and fascinating villages near Palaia.It still bears the vestiges of a far off history as witnessed by the 11th century Parish Church dedicated to San Gervasio and St. John Baptist, and by the castle which is known since 930.It was owned by the Bishop of Lucca, but later on, it passed under the civil rule of Pise till 1436, the year when the small outpost of Pise was conquered by Florence.It was then that San Gervasio saw the presence of important families, such as the Rucella, and the Alamannio Montauto.In the course of the 18th century the ancient fort was turned by the Lords Alamannio into a farm-house which reached its utmost activity between 1830 and 1835 under the rule of Alemanni Uguccioni, Marquis of Florence.In 1880 San Gervasio had 315 inhabitants divided into 30 families and showed the features which were typical of a landed property.In the village you can visit the interesting Museum of Work and Rural Civilization. It was set up in 1984 and collects about 1500 pieces relating to the peasant culture of the Valdera and mainly coming from both the farm and the neighboring villages.